Hail the mighty Pumpkin! The month of October hands-down belonged to this orange giant. From Pumpkin picking, pumpkin carving, pumpkin decor and lots and lots of pumpkin recipes. I kind of overdosed on pumpkin so this recipe would hopefully be the last for a while. After too much of trick or treating i was craving for something savory. 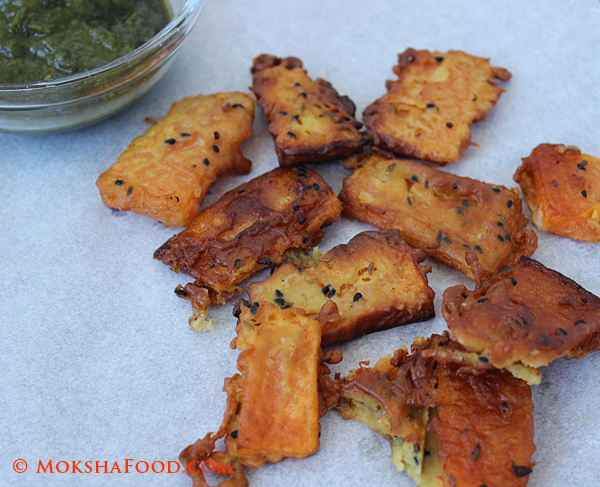 These fried pumpkin fritters paired with mint chutney were the perfect way to end the pumpkin season. Pumpkins may rule over North America but back home my only tryst with this mighty giant was a fable in marathi by the name of Chalre Bhoplya Tunuk Tunuk. Its a funny story about an old smart woman and her intelligent daughter. Both of them lived on either sides of a thick forest. On one of her trips to visit her daughter, the old woman encounters a tiger and a jackal who obviously want to eat her. She tells him that right now she is weak and all bones. She asks him to wait for her on her trip back. She says her daughter will take good care of her and feed her nutritious foods by which she will put on weight - so more flesh for them to enjoy. They agree and let her go. The old woman spends a nice vacation at her daughter's home. On the last day she is worried about running into the tiger again. Her daughter finds an innovative solution. She takes the largest pumpkin available and hollows it. Cuts out small holes to fit her hands and legs through. Then she helps her mom get inside the pumpkin. She promises that the tiger will not recognize her and she would reach home safely. On her way back in the jungle, the tiger recognizes her and orders her out of the pumpkin. The old lady says she is ready to be eaten but the tiger and jackal have to decide who eats her head and legs. A fight breaks out between the two. The old lady takes advantage and gets back into the pumpkin and rolls her way back home safely. Utterly hilarious now but there was a time i really believed this story as a kid. The recipe i am sharing today is a Bengali recipe given by my husband's uncle. 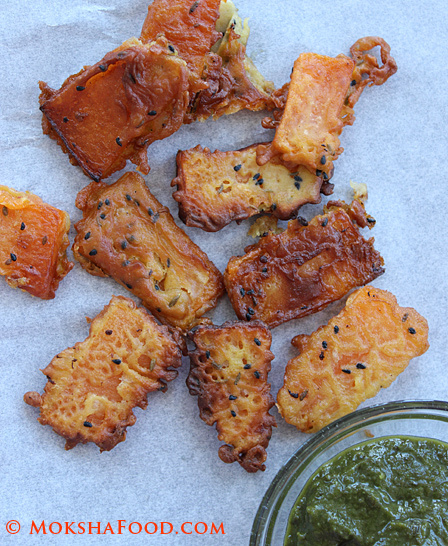 Pumpkin fritters can be enjoyed as a snack , appetizer or a side for an Indian meal. Either way it tastes great and is a good way to get kids to eat their veggies. Make a smooth thick batter by adding just enough water to gram flour. Add in the kalonji, fennel seeds, salt and red chili pdr. Heat the oil to medium in a saucepan. Add 1 tbsp. of heated oil to the batter. This helps the fritters get crunchy. Dip and coat each pumpkin in the seasoned batter and drop gently in hot oil. Cook for about a min. Turn over and cook the other size for about 30 sec. Remove with a slotted spoon onto a kitchen towel to absorb excess oil. Serve hot with your favorite chutney or ketchup as an appetizer or a side to your meal.